A solid rental application allows a landlord to quickly identify qualified tenants, obtain the consent needed to run a tenant background check, lead a debt collector to a tenant who defaults, and flag and prosecute tenant fraud. Is your application up to the task? A generic or outdated rental application form can hamper a landlord’s efforts. Current trends — from the way we communicate to restrictions on what information landlords can collect from rental applicants — impact the effectiveness of rental applications and can create legal traps for landlords. Each question on the application must be relevant and lawful. Do not create a situation where a tenant is forced to skip outdated, illegal, or immaterial questions. This will make it more difficult to determine if the applicant is trying to hide something. For example, the size , weight, and age of a pet are meaningless factors in terms of preventing property damage. Asking if the tenant has a pet — or intends to have a pet — and then warning that any pets must be individually approved is more relevant. Include qualifying questions, like why and when the applicant is moving. The applicant may be in the middle of an eviction or may not be available to move for another month. These are valid reasons to reject the applicant on the rental application alone, without the need to run tenant screening reports. Provide space for tenants to answer in detail. Yes and no answers do little to further tenant screening. Don’t waste time and money formatting the application so it fits on the front and back of one sheet or looks nice. The content is all that matters, and the more information applicants provide, the easier it will be to find the right tenant. Include a cover letter that warns against tenant fraud. Both misrepresentation and omission of facts can constitute fraud. If applicants know that in advance of answering the questions, they are more likely to be truthful — or opt to apply somewhere else. Avoid online rental applications. A recent study sponsored by TransUnion credit bureau determined that online applications are a significant reason for the uptick in tenant fraud. The main reason these formats are problematic is anonymity — applicants can create fake personas or steal the identities of others. The other problem with these forms is that they may not be vetted by attorneys and may be too generic to adequately screen tenants. Know what the laws are regarding application fees. Preprinted application forms may provide for application fees that are not legal everywhere. Typically, landlords can charge for tenant screening, but many states prohibit or limit additional application fees. Fees collected for tenant screening should be refunded if no reports are ordered. Also, landlords should verify qualifications and reject unqualified applicants before running tenant screening reports. Some rental application forms still ask for a home phone. Fewer tenants today maintain a landline or “home” phone, and those who do may not use that line routinely. The term may be confusing, and the form may not provide enough space for alternative phone numbers. A better option may be to ask for a work or daytime phone and a cell — or include all three. Does the application only allow for employment income? This is a common format, but today there is a trend toward legislation that protects tenants who are receiving assistance. Source of income discrimination can occur simply by discouraging applicants from applying by placing the “additional income” category at the end of the form or making that information optional. Also, the “additional income” box may not be large enough for the tenant to include the info needed to verify the income. Some rental application forms do not include a list of the supplemental documentation that the tenant must provide to verify income. This list also can be previewed in the cover letter so tenants can reference those documents when completing the application. A related problem is requiring only specific employment income verification documents like pay stubs because that could be viewed as source of income discrimination. Provide options for tenants who receive assistance, like check stubs or letters confirming the amount of assistance provided. Tenant screening based on criminal history is quickly evolving. Landlords should avoid blanket statements like, “Have you ever been convicted of a felony?” where there is no room to explain. A blanket question that must be answered yes or no can have a chilling affect on applicants, and some who qualify will not apply. That could constitute housing discrimination. While those with criminal backgrounds are not a protected class under the Fair Housing Act, HUD has determined that criminal background checks can unfairly impact minorities and landlords must consider a number of factors before rejecting these applications. At a minimum, leave ample space for applicant answers, and encourage the applicant to include the nature of the crime and when it occurred. Fraud is on the rise, and one of the ways to catch a fraudulent applicant is to compare vehicle information provided on the rental application or found on the credit report with what the applicant drives to the property tour. For day-to-day management, the landlord should be able to identify the tenant’s car to determine if the tenant is breaking any rules. For those reasons, it is helpful to ask an applicant to provide a description of their car, along with the license plate number, on the rental application. Personal references, including emergency contact information, should be included on the rental application. This is crucial for detecting fraud, managing the property, and locating a tenant who defaults. 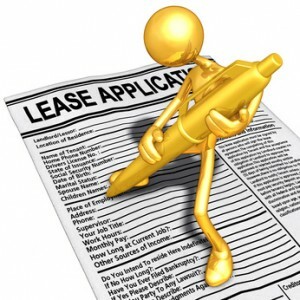 The rental application must state that a tenant background check is mandatory. A rental application form that uses permissive language like, “We may run a background check,” not only encourages tenant fraud, but opens the door to discrimination claims — why are only some applicants screened? The declaration at the end of the rental application must be unequivocal. The consequences of fraud should go behind simply being rejected to include eviction once the fraud is discovered as well as possible legal prosecution. Otherwise, the fraudulent applicant has nothing to lose.